The U.S. Department of Education's Office for Civil Rights released new student absenteeism rates for all 50 states for the 2015-16 school year. Scroll down to learn more. Thirty-six states plus the District of Columbia submitted ESSA state plans that include chronic absence to the U.S. Education Department by September 18. As this table shows, 27 states described chronic absence metric as missing​ 10 percent or​ more​ school days. Four states, Georgia, Minnesota, Missouri, West Virginia, and the District of Columbia adopted a definition of attending​ 90 percent​ ​of​ school days. Three states, Alabama, Hawaii, Nevada adopted the threshold of missing a set​ number​ of days, while Indiana, Montana included other attendance measures. *California uses chronic absence as an academic indicator. Find out more in Who’s In: Chronic Absenteeism Under the Every Student Succeeds Act, a report by FutureEd. Our blog series highlights attendance-related issues that are emerging as states work through the complexities of implementing ESSA. Find the blog series here. The 2015 Every Student Succeeds Act (ESSA) reauthorized the Elementary and Secondary Education Act (called the No Child Left Behind Act when it was updated in 2002). ESSA gives states more power to set their own accountability standards within the parameters described in the law. One new requirement is that states define and measure school quality. ESSA also requires states to report chronic absence data and allows federal spending on training to reduce absenteeism. ESSA gives states the responsibility of choosing at least one indicator, or metric, to measure school quality or student success. These indicators must meet rigorous selection criteria in the law. Chronic absence is one of the few metrics available now to all states and that meets or exceeds the selection criteria. Chronic absence, defined as missing 10 percent of school days within one academic year for any reason, is a powerful early warning predictor of student performance. Information about the scope and scale of chronic absence among students can equip schools—often together with community partners—to help students and families get the additional supports they need to overcome barriers to getting to school. Finally, from a cost standpoint, chronic absence is a measure which school districts must already report to the U.S. Department of Education and is based upon data that they already have. Read our blog and find out more about the attendance provisions in ESSA. FutureEd hosted "Chronic Absence and ESSA"
The U.S. Department of Education’s Office for Civil Rights (OCR) released student absenteeism rates from all 50 states for the 2015-16 school year. This data from all public schools and school districts shows that almost 8 million students were chronically absent from schools in 2015-16. Attendance Works and the Everyone Graduates Center released Data Matters: Using Chronic Absence to Accelerate Action for Student Success, an analysis of OCR data that compares differences in school chronic absence levels from the 2013-14 and 2015-16 school years, while showing the connection between chronic absence levels and demographics. The report, released in September 2018, shares tools for unpacking the causes of chronic absence and provides recommendations for action. The Hamilton Project at the Brookings Institution developed an interactive data map that makes it easy for everyone – families, educators and policymakers – to explore chronic absence data at the school, district, state and national levels. The map accompanies Data Matters: Using Chronic Absence to Accelerate Action for Student Success. For the first time, the U.S. Department of Education’s Office for Civil Rights collected student absenteeism rates from all public schools and school districts nationwide for the 2013-14 school year. The data show that 6.8 million students, or 13 percent of all students, were chronically absent from schools in 2013-14. Find out more about the Civil Rights Data Collection (CRDC), released in 2016, including a separate data story on chronic absenteeism in our Research section. Attendance Works has created a guide for accessing the 2013-14 CRDC to help filter the data for your state or LEA. Find the Guide here. FutureEd developed a blog post describing ESSA’s funding mechanisms that can be tapped by states to improve attendance. These funds are found in Titles 1, 11, and IV of the federal law. Read the post, Tapping Federal Dollars to Reduce Chronic Absenteeism. The Hamilton Project released a report providing a framework for tracking and measuring chronic absenteeism as an accountability metric for schools under ESSA. The report, Reducing Chronic Absenteeism under the Every Student Succeeds Act, includes the most recent data from the U.S. Department of Education’s Office for Civil Rights: an estimated 8 million students nationwide were chronically absent in the 2015-16 school year. The researchers find that health problems and socioeconomic status predict poor attendance. Download the report. In a video, the Hamilton Project breaks down why chronic absenteeism matters for the academic success of all students. View the video, School Attendance: A Building Block of Student Achievement. The U.S. Department of Education's Office of Safe and Healthy Students launched the National Student Attendance, Engagement, and Success Center (NSAESC). The strategies, technical assistance, resources and materials provided by the NSAESC have been developed and compiled by national leaders with knowledge of K-12 early warning systems and student mentoring models. Attendance Works, Everyone Graduates Center, Jobs for the Future, and Mentor all provided materials for the NSAESC website. Find NSAESC's website here. Attendance Works and the Everyone Graduates Center released Portraits of Change: Aligning School and Community Resources to Reduce Chronic Absence, in September 2017. This report relies on the most recent federal chronic absence data for the 2013-14 school year, provides a national and state analysis of how many schools face high levels of chronic absence and discusses the implications for state and local action. 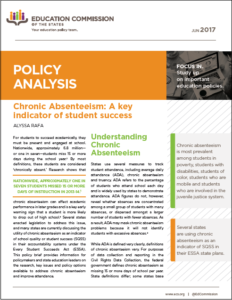 It includes examples of attendance initiatives from communities across the U.S. showing that how chronic absence can be turned around, even when it reaches high levels in a school or district or among a particular student population. It also shares how partners such as businesses, nonprofits and local governments can team up with educators and add support and resources. Who’s In: Chronic Absenteeism Under the Every Student Succeeds Act, a report from FutureEd provides a comprehensive review of the provisions in all 51 state ESSA plans, as well as the results of an analysis of federal chronic absenteeism data. The report draws on the analysis by Attendance Works and the Everyone Graduates Center of the number of schools in the U.S. that have extreme and high levels of chronic absenteeism. 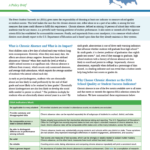 The report table summarizes how the 36 states and D.C. defined their chronic absence indicator. How can funders leverage the Every Student Succeeds Act? 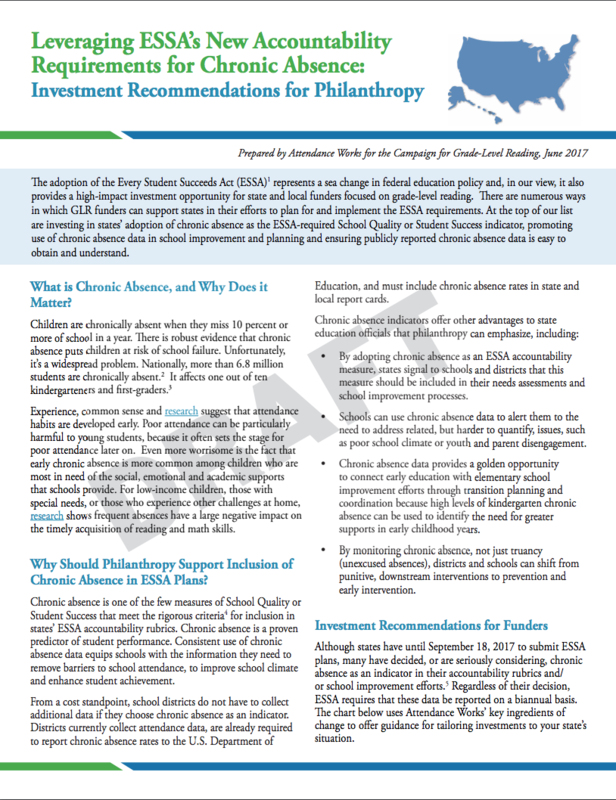 Learn more in our brief Leveraging ESSA’s New Accountability Requirements for Chronic Absence: Investment Recommendations for Philanthropy. Our brief, Chronic Absence: Our Top Pick for the ESSA School Quality or Student Success Indicator, makes the case that the chronic absence rate, either alone or as a part of an index, is among the best measures that states could choose to fulfill this requirement. As states develop their accountability systems, they should consider combining chronic absence with other measures of engagement and school climate. Considering these options and choosing the most appropriate measures is a time-consuming, time-limited process. The Department of Education has developed a timeline from September 2016 through September 2017 and beyond to support states, education stakeholders and administrators while they develop accountability systems. The Brief includes the timeline that can help when developing plans to comply with the final ESSA requirements. Download the brief. 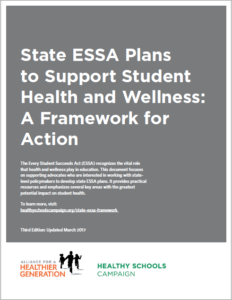 Healthy Schools Campaign and the Alliance for a Healthier Generation have released State ESSA Plans to Support Student Health and Wellness: A Framework for Action. This document focuses on supporting advocates who are interested in working with state-level policymakers to develop state ESSA plans. It provides practical resources and emphasizes several key areas and measures to support student health and wellness. 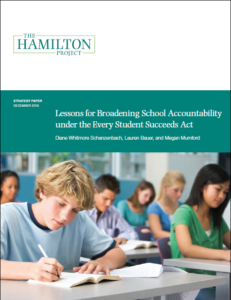 In Lessons for Broadening School Accountability under the Every Student Succeeds Act, the Brookings Institute’s Hamilton Project summarizes lessons learned from the No Child Left Behind Act (NCLB) and how they relate to accountability under ESSA, particularly states’ choice for the required new fifth indicator of “student success or school quality.” The strategy paper explains why chronic absenteeism is a good candidate for adoption as the fifth indicator because it is a valuable indicator of “school quality or student success” and performs well with regard to lessons learned under NCLB. The strategy paper includes an interactive map describing the distribution of rates of chronic absenteeism by state. The policy analysis by the Education Commission of the States, Chronic Absenteeism: A key indicator of student success, discusses chronic absenteeism as a key indicator of student success and provides an overview of issues and policies that states are addressing related to attendance guidance, raising public awareness, building better data systems, supporting school improvement and increasing accountability. For an overview, watch this video.